Home Interview Thunderbirds Travel Prints Are Go! Calling International Rescue! 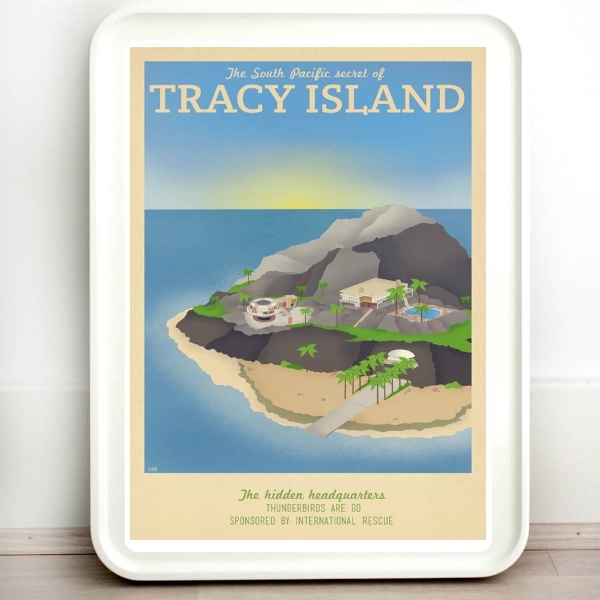 These incredibly stylish vintage travel poster inspired Thunderbirds art prints are absolutely FAB! 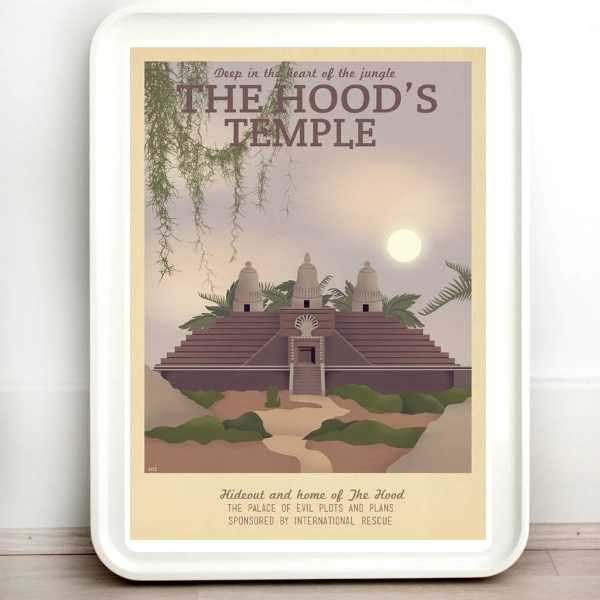 Boasting a blend of retro charm and futuristic designs, they look fantastic on display anywhere in your home or in the control room of your top secret island base! The prints are the creation of Ali Winter of Teacup Piranha and each design is available in a wide variety of sizes that would impress even Brains. We packed our interview kit, boarded Thunderbird 2, and blasted off for England. Our mission? To find out more about Ali and the range. Hi Ali, could you tell us a little bit about yourself and Teacup Piranha? Of course! Teacup Piranha was established in 2013 with an aim of bringing art to walls all around the world. Each print is designed, printed and posted in house, ready for framing. I am born and bred in East Sussex, England, but am shortly making the exciting journey to a new home in The Netherlands. Was there a moment in your life when you knew that you definitely wanted to become a designer? I’ve always been rather creative. I was far more interested in Art and Graphics at school than I was Science or Maths. I knew that I wanted to do something with design, be it interior design or graphic design, so I decided to combine the two! When did you first discover Thunderbirds and what were your first impressions? I have my Dad, Richard Winter, to thank for introducing me to the world of Thunderbirds, and Gerry Anderson’s other creations. He is a huge fan of the show, so it has always been a part of my life. I remember watching it at tea time, waiting for the countdown until THUNDERBIRDS ARE GO! My dad works with me, helping me print orders, and we often find ourselves humming the theme tune. What was it like growing up as a Thunderbirds fan? I am very lucky to have been brought up in a household which adores science fiction. Growing up with shows such as Thunderbirds really does make you feel like part of a huge family. As soon as I hear the theme tune, I get a warm sense of nostalgia and become a child again. I’ve enjoyed watching the series just as much as an adult now too and feel so lucky to be part of the Thunderbirds journey. It has been over 50 years since Thunderbirds first aired, what do you think is the secret of the series’ lasting appeal? Thunderbirds was always way ahead of its time, and in many ways it still is. Spaceships, new technology and clever cinematography kept people coming back. I love how even though the characters are faced with dangerous situations, they manage to get through them. There are always brilliant morals to the stories. I think the puppets have a huge part to play in why I personally like it so much. They each have such unique characters, especially Brains, who has such an iconic look. 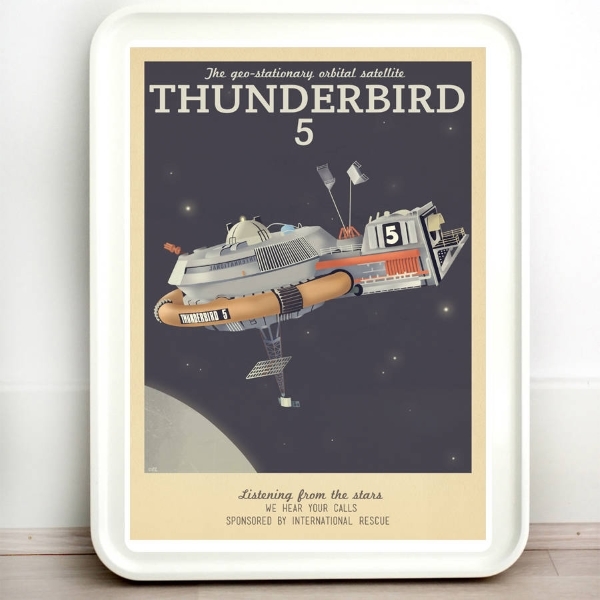 How did the idea for your Thunderbirds Vintage Prints range come about? If I remember rightly, it was after receiving a newsletter from the Official Gerry Anderson website. It was actually my Dad who said it would be fun to draw some of the locations from the series, and he was right! It’s been a very good excuse to re-watch the series. It’s officially been my favourite range to work on so far. What influenced your choice of images for the range and do you have a personal favourite? It was really hard to choose 5 locations as I wanted to include places that people could imagine visiting (despite it all being top secret!) 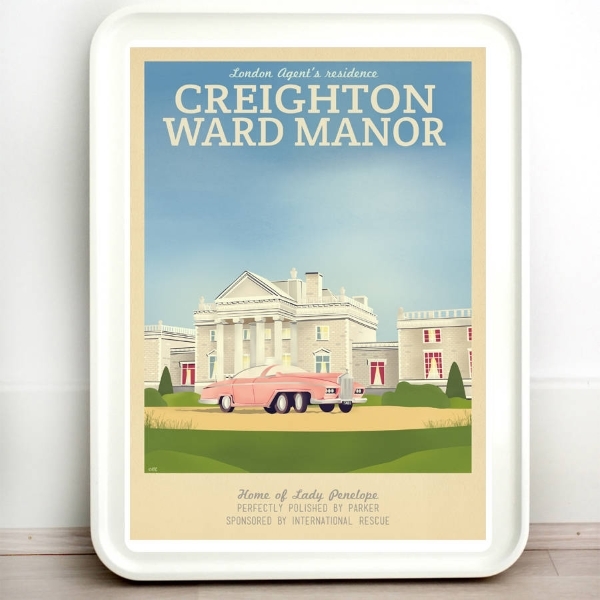 My personal favourite has to be Creighton Ward Manor though, purely because I got to draw FAB 1. I always imagined I’d have a car like that one day. A girl can dream! Thunderbird 5 gets an impressive print all to itself, but the craft’s design frequently divides opinion. Are you a fan of International Rescue’s eye-in-the-sky? It certainly was a tricky one to draw, but I must confess that it was always one of my favourites, I think because it was actually up in space. My favourite craft was Thunderbird 2 though as it contained Thunderbird 4 and had the coolest take off sequence with the trees parting to make way for it. The prints share a common theme of travel, if you could travel anywhere, where would you go? If I could go anywhere, I’d love to do a tour of Western America. Las Vegas and the Grand Canyon are right up there on the top of my bucket list. Do you have any plans to expand the range in the future? I would love to expand the range and add some locations from some of Gerry Anderson’s other shows such as Stingray or Captain Scarlet. I already have a few ideas so watch this space! Thanks to Ali for talking with us and we really hope you enjoy her inspired artwork! Prints are made to order and are available now at the Official Gerry Anderson Shop in multiple sizes to suit your needs. Don’t forget to enter our Prize Giveaway for your chance to a win a full set of A4-size prints in all 5 designs!